Sound familiar? These are words and phrases I use to be of service, to help others, to fill in the gap… fill in the blank. They are useful, true and authentic. They are valid much of the time. They are invalidating some of the time. I am so fortunate in life. I have been given talents, opportunities and a security. I have been able to get an education, to hold several jobs, raise a wonderful healthy family and be friends with amazing people. Many people have none of these, some only a couple. I feel deeply compelled to share when I can. I have a wonderful family. They ask little of me now. There was a time as a full-time single working mom, the list of requests and need seemed endless. Between school and sports, supply duties in the house and homework, friends and meetings – there was an unending list of things to do and things undone. My time was not my own. As a woman in recovery service has been and remains a critical part of my integration with my 12 Step program. As a yoga teacher my focus is primarily on people in recovery and therapeutic styles of yoga. Both are callings that CALL. I try not to say “no” when asked to participate in aspects of my recovery program; sponsorship, secretary or chair. In times past I have been involved in Hospital and Institution work; another form of service. In my yoga practice I have regular classes, private students, and opportunities to substitute for other teachers. I am asked from time to time to organize a workshop. I write and I teach. My time now is mine to use and to share as best as I can. I avoid over sharing and over doing. It is not best for my students, and certainly not best for me. I juggle and re-order my time accordingly. Occasionally I am less skilled at that than others. My lack of skill comes from old patterns. I have some bad habits. I am prone to over do, over commit, over offer, and I under “NO”. The cost of this can be great. I become tired, resentful, and irritated. I then become hopeless, depressed, and find fault with myself. The results of over-yessing are apparent in my attitude and behavior. It desire to say yes often comes from wanting to be all things to all people. That is one aspect of coming from my EGO. Then there is the tenderness and pain I feel when someone says “no” to me. It can hurt. I have no desire to inflict the sensation on anyone else. I assume that they will hurt. I manage their feelings by giving up my own. This is also a type of control. It is grasping and it is aversion. Holding on to an idea of myself as ALL-DOING, all capable and avoiding the discomfort that can come from not getting or giving what you want. Time to come back to yoga. 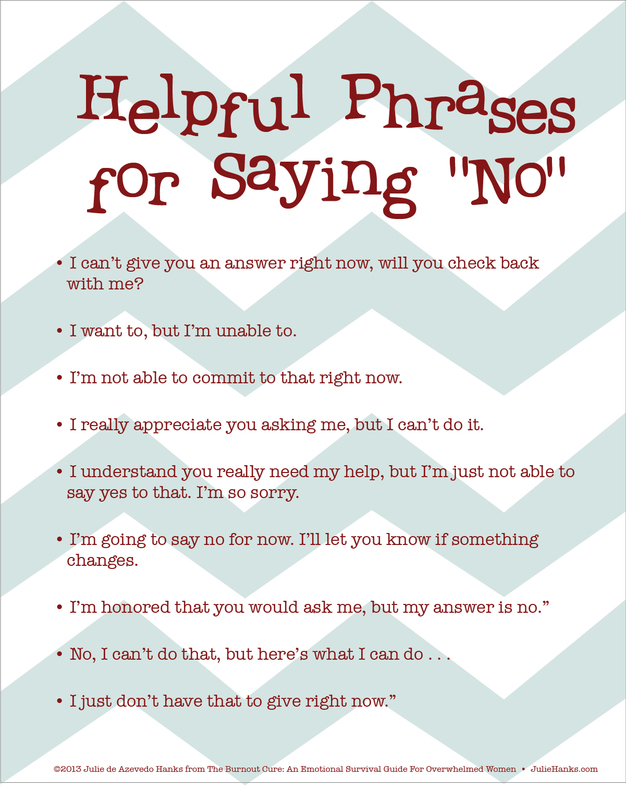 Over and over I return to my spiritual practice of saying “no”. I need adequate time for my own self care. I need adequate time to rest. I notice where I am going off course and I readjust. I return to the rituals of morning practice and meditation, to take the time to smell the flowers in life, to take the time to do nothing at all. It is in honor of my true self, my inner being, that I practice saying “no”. By learning to say “no” to that which I can, makes the YES to myself meaningful, and the YES I say to others more authentic.